Thank to everyone who entered the Book & Bento giveaway! I loved reading all of your comments. The winner is @arcticmama1 on instagram. If you would like the book head on over to the Running Press Books website. If you'd like the bag, I've restocked my shop with a small supply of Bentos. 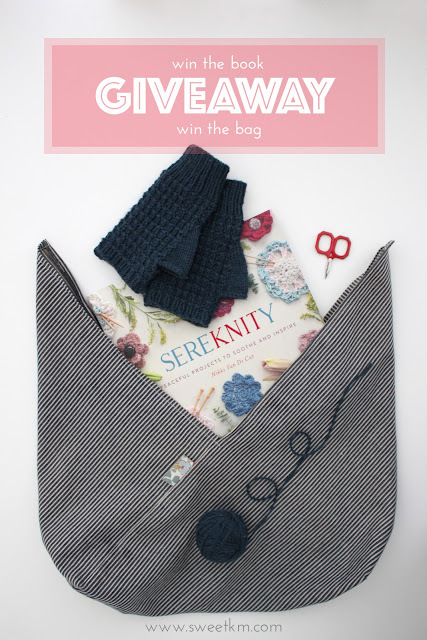 For the last few weeks I've been knitting my way through SereKNITy: Peaceful Projects to Soothe and Inspire by Nikki Van De Car. This book includes more than 25 simple knitting, and crochet projects with simple stitch patterns and construction methods that keep your hands busy, and your mind free. There is everything from a tea cup cozy, to a button front cardigan, and lots of scarves and hats in between. This is exactly the kind of knitting I like to do. I like to keep my hands moving while I binge on Netflix, or chat with my husband at the end of the day. These projects leave a little head space for other things. In the off chance that I'm knitting quietly alone, this is the sort of pattern that lets your thoughts flow, and good ideas come out of hiding. All of Nikki's projects could go to a coffee date, or beer night with friends, and not miss a stitch, or a word of the conversation. Because all of the projects are relatively simple, they are great for the beginning knitter. I made the Portland fingerless gloves. I had a partial skein of Brooklyn Tweed Arbor left over from my last hat project, and I thought some spring mitts would go well with my spring hat. The texture of these mitts is made using only knit and purl stitches, and a short 4 row repeat. They knit up quickly over our last two car trips. I was a little worried I would run out of yarn, so I shortened them a bit from the instructions (details in my Ravelry notes). All of the SereKNITYy projects leave room for the knitter to improvise. 1. Comment on this blog post. Be sure to include an email where I can reach you with the comment. 2. Follow me on Instagram. Like my post (which will appear later today) on Instagram, and leave a comment there. You may enter both here and on instagram, but only one entry at each place per person. Entries from any country are welcome. I will randomly pick a winner at 8pm Sunday April 23, 2017. Running Press Publishing provided this book for free, but the opinions are my own. I reviewed one of my friend Virginia's books a few years ago, and was already familiar with what Running Press has to offer. The bento bag is gorgeous! thanks for the giveaway! Such a cute bag and the book sounds interesting too. oh how I would love to win this! I'm a new knitter and just finished a beginner shawl and I'm now working on your newest pattern! I'm so enjoying it and would love to have some more beginner patterns to work through as I build my skills. Thanks for the giveaway!! What a lovely group of things! Thanks for the chance. jennifer.a.strickland(a)gmail(dot)com. Such a lovely bag and giveaway - Thank you! Loving the Bento Bag.......so cool and I can just picture it holding my current yarn and needles waiting for me to dig in. THe book has some awesome, easy projects for this novice knitter. Who knows, maybe crochet is also on my bucket list to learn. Thank you for Sponsoring.